AKAM (5/20) is very tempting at $50. Woops, that one is long-gone now but what a great bottom call! CCJ (new) is down with uranuium as Japan has been slow to restart their nuclear program (depressing demand). Over time it will bounce back and CCJ is very nice for a long-term accumulation at $19.21. They don't pay a dividend, so there's no reason to own them and you can sell the 2016 $15 puts for $1.30, which nets you in for $13.70, which is 28% off the current price. Since $15 is 22% off the current price, you can be more aggressive and consider the $1.30 to be free money and add the 2016 $17/22 bull call spread at $2 and that makes the trade net .70 – but it's $2.21 in the money to start! CLF (new) is another perennial favorite at PSW. I just gave a whole lecture on why I still like them in Thursday's Live Webinar, so we can skip the fundamentals and just say "we like it." This stock is never short on heartache and you need a cast-iron stomach to ride out the dips but below $18 is where we like them and now they are below $15 so – we like them more! That being said, we'd like them even more for $9.85 and we can sell the 2016 $13 puts for $3.15 and use that money to buy the $13/20 bull call spread at $2 for a net $1.15 credit and an $8.15 upside at $20, which would give us an 700% gain on cash if CLF can manage it's way back over $20 - that's good leverage! ThinkorSwim tells me it needs $1,440 in margin for 10 of these so you get a net $1,150 credit and you start out $1,500 in the money (at $12.50) with the hopes of finishing with $8,150 in Jan 2016. This is how we like to grow our money. On the downside, if CLF is below $13, we will be assigned 1,000 shares for a net cost of $11,850 ($11.85 per share) and then, since we like them long-term, we can sell long-term calls for another $2 to knock the basis down to $9.85 – but we'd cross that bridge if we come to it. At the moment, the bears are piling on this one, so we're waiting but likely to step in soon. EBAY (5/20) still cheap (got 'em in our Income Portfolio). As a new entry, we're waiting to see how low they can go. They are down because Google has changed their search engine rules to de-emphasize the way Ebay (and other companies) list things. This is our favorite kind of alarmist nonsense as Ebay has teams of very smart people who will adapt and survive and this is unlikely to be more than a blip for them. At the moment, I like selling the 2016 $45 puts for $4.10 as an initial net $40.90 entry (18% off the current price) – but I like waiting PATIENTLY even more. If they cross back over $50 and hold it, that's a good signal to get in, but never underestimate the ability of idiot analysts to extrapolate a short trend into a long one and scare people out of a perfectly good stock! ED (6/3) is another boring utility stock near the bottom of it's range at $55. 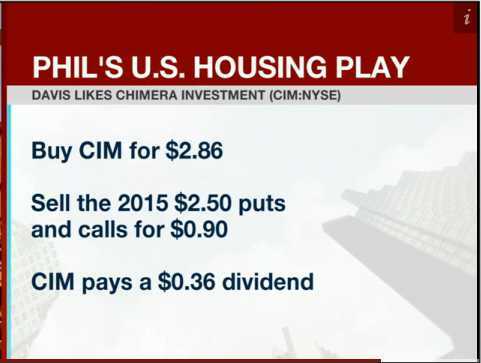 This one pays a $2.52 dividend but also don't have 2016 contracts yet. You can sell their $55 calls for $2 and the $55 puts for $3 for net $50/52.50 with the same boring game plan but it's nice to have a few boring stocks in your portfolio. This one almost got away but then thought better of it. FCX (5/28) is right at the 200 dma at $33.75 and the 50 dma is going to move above the 200, which is very bullish if they hold $33.50 (and notice the nice bounce today). Long-term, people do use copper, so I like selling the 2016 $30 puts for $3.20 for a net $26.90 entry, which is 20% off the current price. To me, that's just free money, since I'm happy to own FCX at $30. So it makes a nice, bullish offset to a hedge. If you want to be more aggressive, you can add the $30/37 bull call spread at $3.15, that has 122% of upside if FCX moves up just 10% by itself but, combined with the short puts, you net a .05 credit and make $7.05 (14,100% on cash) if FCX is at $37 in Jan 2016. They've popped a bit since our pick but only $1 so far. As with all our picks, we prefer the ones that get cheaper. HMY (6/3) is another beaten-down miner (it often is) and it's back to where we liked it last year. It's a good stock to play if you remember to get out when they go higher and don't let greed overwhelm you and make you forget why you got in (for a quick gain on a bounce). People don't like our long-term trades because they think they won't make quick money but, as you can see from our trade reviews, they often make fantastic money in short periods of time AND you have much better downside protection. Making money with less stress is always a good thing. The company will make .18 per share this year, not a bad p/e if we knock the price down. At $2.60, you can just buy the stock and sell the 2016 $2 calls for $1 and the $2 puts for .35 for a net $1.25/1.63 entry and that's $1 off (38%) the current price – nothing wrong with that. In fact, it's the best play but you COULD be super-aggressive and sell the $2 puts for .35 and buy the Jan $2/3 bull call spread for .45 and you're in for net .10 on the $1 spread that's 0.60 in the money (up 500% if it stays here) to start and your worst case is a reasonable net $2.10 entry (25% off). Let's not forget HOV (5/13) at $4.63. They are a constant buy for us in large part BECAUSE we can sell the 2016 $4 calls for $1.40 and the $4 puts for .75, which drops the net to $2.48/3.24 and that's 30% off the current price as your WORST outcome! Notice they dipped down to EXACTLY $182.50 and now are bouncing back. In this particular case, we now look to see if it makes a strong or weak bounce, per our 5% Rule™. Since the drop was from $200 (and yes, I know we didn't actually hit it, but it's the goal) then we take the $18 drop and call a weak bounce $3.60 to $185 (past it) and a strong bounce $188.50 (not an exact science) and we won't be too impressed until it crosses back over that line. IRBT (5/13) is our Stock of the Century and I can't believe it's back to $33.15. They don't have Leaps so we just grind the price down by selling Dec $30 calls for $6.60 and 30 puts for $3.45 to drive the net down to $23.10/26.55, which is a very nice, additional 20% discount. I was right not to believe $33.15, though it did go a bit lower before recovering. ISRG (5/20) is one we always like when it's cheap and they're back at $364.40 and one of the best reasons to enter a bullish play is because you have a very obvious line at which to get out. $350 is an obvious line. The 200 dma is actually at $400 and the 50 dma, at $415 is going to death cross soon (unless ISRG rockets back over $400), so no hurry on this one but well worth watching. 2016 $300 puts are $28 for a net $272 entry and that's another 25% down from here. This one is drifting up already – a very likely official play for next week. JDSU (5/20) got crushed on earnings but have held up well since. They missed estimate AND lowered guidance but it's not their fault as the Telcos simply delayed spending on fiber last Q and – THE WEATHER! This is kind of like when I put my foot down on ALU a couple of years ago – I don't care how bad they look now, these are the guys who wire up the internet and, eventually, there's a Trillion Dollars worth of fiber that needs to be laid around the World. The 2016 $10 puts can be sold for $1.55 for net $8.45, which is 22% off the current $10.90 – it's a nice way to play them to start. KBH (5/13) is the first builder I've liked since HOV (which I still love at $4.63). Earnings were .41 vs -.76 last year's Q1 yet they are not being rewarded for it, probably because their debt/equity ratio is up near 4, but that's mostly because they wrote off most of their inventory, the debt itself is just $2.2Bn and serviceable under current cash flow. When you buy a builder at this stage in the cycle – you are essentially giving your money to a professional to invest in housing. KBH is solid and, because they've taken massive losses in the past 5 years, it will be 5 years before they have to pay any taxes on earnings – that's nice too. No dividend (.10) means no reason to own the stock and, because they look scary, we can sell the 2016 $13 puts for $1.60 and use that $1.60 to buy the $!5/25 bull call spread for $2.90 for net $1.30. So we effectively own KBH for $16.30, which is what the stock cost now but, if it drops all the way below $13, we only have a net $14.30 cost if it's put to us. So $2 of cushion for free and we make 100% of the upside between here and $25. We can also potentially sell some short calls along the way if they move up a bit more. This one is on the move, another top candidate for next week. They are on the prowl to merge with NEM (5/28) and the deal is off at the moment but there's an expectation of $1Bn in synergistic savings per year (the idea is they would keep all the low-cost mines and sell off the rest), so it might come back to the table. NEM is as out of favor as ABX at $22.41 and we can pick up the 2016 $20/25 bull call spread for $2.20 to net in at $22.20 and, if they get bought for $25 – it's a quick double! NLY (new) is another REIT favorite of ours and pays a lovely $1.20 dividend. It's certainly not cheap at the moment but not terribly expensive either. For an entry, we can't argue with selling the 2016 $12 puts for $2.35 to net in at $9.65 (17% off) because it pays more than the dividend (since we missed 2 quarters this year) over an 18-month hold. If we do get assigned, we get a cheap entry and, if they crack over $12, we could still buy the stock and sell the 2016 $12 calls (now .50) for perhaps 0.75 and then we'd be in the stock at net $8.90/10.45 and the anticipated $1.80 dividend would drop us to $7.10/9.55 so, either way we net a $9.55(ish) entry – it's just a question of whether we get 1x or 2x and we'd only be in 2x AFTER they break over $12. Clever, isn't it? NTAP (5/20) has earnings tomorrow (as we can see, in retrospect, they went well) and expectations have been lowered to the point where they seem a bit silly. They beat by 3.5% last Q but gave crappy guidance but they've already laid people off and cut costs so, even if they miss this Q, I'll still like them later. In this case, I'd just sell the 2016 $30 puts for $3.40 for a net $26.60 entry, which is 22% off the current price and, if they do miss and go down (but we think they'll come back) THEN we can add a bull call spread and, if not, then it's just fee money. Let's sell 5 for $1,700 in the STP and we'll push it to the LTP if they fail. Those puts are now $2.70 ($1,350) for a very quick $350 (20%) gain – so far. That's a very important point to make – we don't have to make short-term plays to make excellent short-term profits. We were right about NTAP's earnings and made 20% in a few weeks but, since we took a nice, conservative LONG-TERM entry, had we been wrong, we still had plenty of cushion (22%) and a nice, cheap entry down the line. There's no need to take big risks to make REASONABLE returns (assuming we can agree that 20% in less than a month is reasonable). PFE (5/20) is cheap at $29.42 and they pay a $1.04 dividend but we can blow that off and sell the 2016 $30 puts for $3.80 and use that money to buy the $23/30 bull call spread for $4.40 for net 0.60 on the $7 spread that's $6.39 in the money to start. If all goes well, it's a 1,066% profit in 18 months on the cash and TOS says the margin on the put side is just $6, so margin-efficient too! If you REALLY want to own 500 shares of PFE at $30.60 in 2016 ($15,300), then 5 of these spread contracts cost just $300 in cash, $3,000 in margin and pays $3,500 if PFE is over $30 in Jan 2016. That one is worth putting 10 in the Income Portfolio. PNW (6/3) is a nice 4% dividend pays ($2.27) and, if they had 2016 options, I'd like them for the butterfly portfolio because they are so boring. Interestingly though, you can buy the stock for $55 and sell the Jan $55 calls for $2.75 and the $55 puts for $3.20 for a net $49.05/52.03 entry. It's nothing too exciting but it's a nice stock to whittle away the basis of for a long-term hold in your portfolio. RIG (5/20) is still cheap at $41.47, off the lows at $38. The 2016 $35 puts can be sold for $3.55 for a net $31.45 entry and that's nice by itself and makes a nice offset to a bear trade. Net margin on the short puts is $3.50 so it's a 100% return on margin – very efficient. It can be paired with the $40/50 bull call spread at $3.20 for a net .35 credit and your worst case is owning RIG for net $35.35 (15% off) while the upside is up to $10.35 at $40 for a 2,957% return on your cash. These guys are moving up fast, if they go over $43 it might be a good idea to jump in. RRD (5/13) pays a fat $1.04 dividend and the stock is down to $15.85 so you know I like a buy/write for this one. We can buy the stock and sell the 2016 $15 calls for $2.35 and the $15 puts for $2.70 and that's net $10.80/12.90 and that makes the $1.04 dividend 9.6% while we wait to get called away with another 38% profit. Worst case is owning 2x at $12.90, which is 19% off the current price. As you can see, this one bucks like a bronco but I'm comfortable with the bottom call we made on the 13th. TASR (5/13) is shorter-term, since it's our Stock of the Decade and they've dropped off 1/3 from their $20 high so we like them again at $13.62. They do have Leaps so we can sell the 2016 $13 puts for $2.50 and the $15 calls for $3.20 for net $7.92/10.46, which gives us another 22% discount on this one. TEX (5/20) is one we used to like in the teens but they'll never see the teens again, now $39.80. It's a building and infrastructure play and I know from trying to raise capital for a real estate venture last year that NO ONE is going to be breathing down their necks for a long time. In fact, they've been able to buy up a lot of their competition and pick up equipment from failed competitors for pennies on the Dollar in the down market. Last earnings indicated they were backlogged on orders and the 200 dma is $38 and I doubt they go lower than this. They don't pay a dividend (0.20), so no reason to own them but you can sell the 2016 $35 puts for a very nice $5.30 for a net $29.70 entry and leave it at that or add the $30/40 bull call spread at $5.50 for net .20 on the $10 spread that's almost 100% in the money. This one is too good – gotta pull the trigger on 5 in the Income Portfolio! Another well-timed, quick winner! UBNT (5/28) was Wombat's idea from yesterday and we'll add them as a Tech pick. We like the 2016 $45/55 bull call spreads at $2 and they aren't going to get any cheaper (relatively) so we may as well get 10 of those in the Income Portfolio for $2,000 so we can keep an eye on them. WEN (5/13) has taken a nice dip but they just put in solid earnings and $8.37 is a nice discount off the $10.22 high. I think $10 was a bit silly but so is $8 and we can be conservative with these guys and skip the .20 dividend and just sell the 2016 $10 puts for $2.80, which is net $7.20 so another 20% off from the current price and TOS says the net margin is just $1.60 so super-efficient return of 175% on margin if you're willing to own WEN for net $7.20 and they get back over $10 in 20 months. The nice thing about this is that anything over $7.20 is still a profit. WFM (5/13) I have not liked for ages but $39.43 finally gets their p/e into the low $20s and they are moving into the UK and, as we've discussed before, they are merely getting squeezed by rising food costs they haven't passed on to customers yet. So that's 29 stocks we can choose from as we repopulate our LTP – and we haven't even discussed the positions that were already in the Long-Term Portfolio that we still cashed out but still like! It's going to be a very exciting second half of the year and we'll kick things off on Tuesday, when we'll look to add our first few official entries. This entry was posted on Saturday, June 7th, 2014 at 8:24 am and is filed under Appears on main page, Members Only, Uncategorized, Virtual Portfolio Review. You can leave a response, or trackback from your own site. Are The One Percent Making The Housing Recovery Look Stronger Than It Actually Is? Bloomberg View columnist Mohammed El-Erian examines this week’s historic actions from the European Central Bank and explains why they will not be enough to solve Europe’s economic problems. The start of the World Cup is just one week away — the first match is June 12 in Sao Paulo. In most countries around the world, The Cup is a highly anticipated and religiously followed, twice-a-decade event. June 2: Song Seng Wun, a Singapore-based economist at CIMB Group Holdings Bhd., talks about China’s economy and government policies. China’s exports rose more than analysts estimated in May, helping to cushion the world’s second-biggest economy from a deeper slowdown as an unexpected slump in imports highlighted risks to growth. June 9 (Bloomberg) — Takahiro Sekido, a Japan strategist at Bank of Tokyo-Mitsubishi UFJ, talks about the nation’s economy, government and central bank policies. increased more than previously reported. falling short of the fund flows needed to weaken the yen. May 16 (Bloomberg) — Milan Vaishnav of the Carnegie Endowment for International Peace, talks about Narendra Modi’s opposition bloc’s victory in India’s election and the political and economic challenges facing the new leader. dollars stashed overseas to avoid taxes. May 22 (Bloomberg) — Marc Faber, publisher of the Gloom, Boom & Doom report, and Ian Bremmer, president of Eurasia Group, talk about U.S. initial public offerings by Chinese companies, the economy of China, the outlook for U.S. stocks and bonds, and investment strategy. the right to host the 2022 World Cup through improper means. Now it’s Sony versus Facebook. conference, looks like a do-over. began involving an envoy of Russian President Vladimir Putin. June 9 (Bloomberg) — Fraser Howie, a director at Newedge Singapore and co-author of “Red Capitalism: The Fragile Financial Foundation of China’s Extraordinary Rise,” talks about the nation’s economy, government and central bank policies. Asian debt fell toward a 13-month low and wheat jumped. Speculators cut bullish bets on U.S.
high following the Memorial Day weekend. the Internet bubble steamrolled defensive trades. pumping a record amount of crude.